Looking for better pricing? Contact us! *Price per User for quantities 2-25. Quantity must be 2 or greater. *Price per User for quantities 26-50. Quantity must be 26 or greater. *Price per User for quantities 51-250. Quantity must be 51 or greater. *Price per User for quantities 251 or more. Quantity must be 251 or greater. 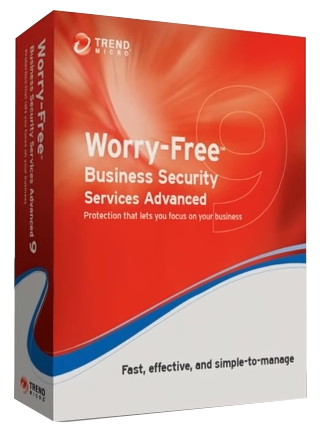 Trend Micro Worry-Free Services Advanced provides cloud-based, enterprise grade security designed specifically for businesses, with centralized control for your Windows, Mac, and mobile devices. The management console allows you to manage your multiple device platforms with one online console, so you can access it anywhere. Worry-Free Services Advanced sends automatic updates so you can focus on your business instead of your security applications. You can enforce your security policy to employees anywhere—whether they’re in the office or at home—and affordable pricing and annual subscription billing makes your security truly worry-free. Targeted attacks, like ransomware, are blocked at the email gateway which prevents them from ever reaching your users. This means they won’t have the chance to click on a malicious link or open a spear phishing email. In just a short 30-day snapshot, Hosted Email Security blocked more than 1.4 million emails that contained ransomware. Growing numbers of smaller businesses are being victimized by cyber criminals’ data theft schemes that use spam, malware, phishing, and advanced targeted attacks – custom-built to bypass traditional antivirus. Trend Micro™ Worry-Free Services Advanced, powered by XGen™ security, is cloud-based security designed specifically for small businesses with award-winning device and email protection. To save you time and resources, it is hosted and maintained by Trend Micro and combines Trend Micro™ Worry-Free Services to protect your devices, Trend Micro™ Hosted Email Security to protect your on-premises email, and Trend Micro™ Cloud App Security to protect your Microsoft® Office 365™ email, OneDrive, Sharepoint and collaboration tools such as Google Drive, Dropbox, and Box. Trend Micro Worry-Free Services, powered by XGen™ security is the first to infuse high-fidelity machine learning which uniquely analyzes files not only before execution but also during runtime for more accurate detection with other detection techniques for the broadest protection against ransomware and advanced attacks. Worry-Free Services Advanced, powered by XGen™ security, infuses high-fidelity machine learning with other detection techniques for the broadest protection against ransomware and advanced attacks. Protect devices on or off the network and optimize performance by applying the right protection technique at the right time. Hosted Email Security is a no-maintenance-required solution that delivers continuously updated protection to stop spam, malware, spear phishing, ransomware, and advanced targeted attacks before they reach your network. Cloud App Security enables you to embrace the efficiency of cloud services while maintaining security. Worry-Free Services, powered by XGen™, blocks ransomware and its latest variants, including WannaCry. Worry-Free Services Advanced, powered by XGen™, is hosted in the cloud and maintained by Trend Micro which means you’ll never have to apply a hotfix, patch, service pack, or upgrade ever again. We ensure that you always have the most up-to-date protection so you can focus on your business, and let us focus on securing it. TrendDefense.com is a division of Virtual Graffiti Inc, an authorized Trend Micro reseller.